Cafe Colonial seemed to appear out of thin air. For those who are unfamiliar it is a fairly recently opened venue located between The Colony and the Colonial Theater off of Stockton Blvd. This all ages venue/restaurant is operated and owned by Matt Marrujo, Mickey Rat, Jennifer Kubach and Steve Waite, all people who are completely submerged into the Sacramento music scene. As my friend Steph Rodriguez would say, “It’s not even a mile” [from the grid]. So why is it so hard to get the “die-hard” music fans out of their comfort zone to see some great shows? Granted the Cafe’ doesn’t serve alcohol (yet), but they do have some very reasonably priced food. And oh yes, there is music, lots of music. Local and touring bands fill both the Cafe’ and The Colony five days a week and have for quite some time now. In the three months that the Cafe has been opened they have had some fantastic shows. Koffin Kats, The Babies, The Community, RAD, The Moans, Jesus Christ Mister!, Julie the Bruce, The Left Hand, The Harbor and Sun Valley Gun Club have all taken the stage. Ken Doose moved his three-day music extravaganza, Bat Guano Fest, on over to the Cafe this year also. This is just the beginning of what seems to be a very promising year musically. Along with a line up of upcoming shows including Croissants (Dec 7th) and Dead Dads (Dec 28th) they are now the home of TUNE UP, a singer songwriter showcase hosted by Kevin Seconds and David Houston. Every Wednesday night starting Dec. 18th Kevin and David will host a rotating guest. The debut show will be feature Tom Hutchison from the Knockoffs and the following week will feature Dr. Velocity. If you are yet to visit the Cafe’ tonight is the perfect night to start. 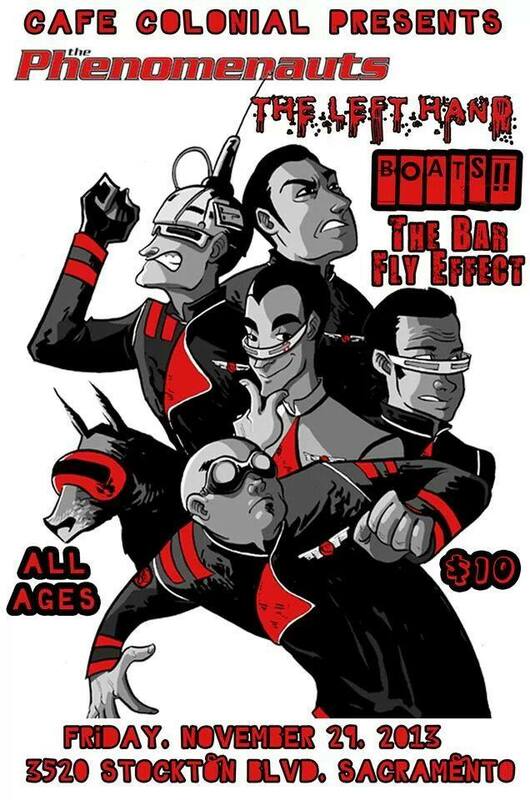 It’s a great line up featuring the Phenomenauts, The Left Hand, The Bar Fly Effect, and BOATS!. Trust us, this show will be phenomenal. See you there! Tags: Bat Guano Fest, BOATS!, Cafe Colonial, Cafe Colonial venue, Croissants, david houston, Dead Dads, Dr. Velocity, Jennifer Kubach, Jennifer Kubach and Steve Waite, Jesus Christ Mister!, Julie the Bruce, Ken Doose, Kevin Seconds, Knockoffs, Koffin Kats, Matt Marrujo, Mickey Rat, Music, Phenomenauts, RAD, sac music, sac music scene, sac venues, Sacramento, sacramento music, sacramento venue, Steph Rodriguez, Steve Waite, The Babies, The Bar Fly Effect, The Community, The Harbor, The Left Hand, the moans, Tom Hutchison, TUNE UP. Bookmark the permalink.